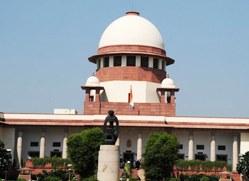 The Supreme Court has ruled that number of deaths in a criminal case is not a relevant factor for awarding death sentence to the accused. A bench comprising Justices Arijit Pasayat and Mukundakam Sharma while upholding the judgement of Allahabad High Court commuting death sentence to life imprisonment in a Double Murder case observed, ‘It is to be noted that number of deaths in a case would not be determinative factor for awarding death sentence and capital punishment can be awarded even in a case of single death.’ Two people were killed on December 16, 2001, in Aligarh in a clash due to political rivalry. The trial court, Aligarh, had awarded death sentence to Aqeel Ahmed after holding him guilty of Double murder. One MLA Chaudhary Alim was also involved. Two of the accused died during the pendency of the appeal. The Allahabad High Court, however, reduced death sentence to life imprisonment holding that the case did not fall in the category of rare of the rarest. The quantum of sentence always depends on the brutality involved in the crime of murder. The apex court, however, upheld the conviction of the accused Aqeel Ahmed.